Before entering a Schutzhund trial every dog must have passed a Bh(companion dog) and a temperament test is performed at each trial. Minimum age for a dog to get any working title is 18 months. Every track is judged out of 100 points. You need 70 to pass. Absolutely no air scenting is allowed. Dog must work closely and attentively to track and indicate articles correctly. Dogs are judged on maintaining steady speed, concentration, ability to work independantly of handler, problem solving, and working footstep to footstep. All tracks must be laid using a natural stride and no scuffing or stomping in of corners. Tracking can be held on all natural terrains inclding meadow grass, pasture land, plowed or dirt fields and forest soil. The decision regarding the suitability of tracking land is the duty of the judge. Change of cover and terrain ins Sch1 through 3 is possible and in the FH, it is absolutely required. At minimum, FH tracks must cross once over a hard, well traveled street or gravel road. Holding an FH test on a continuous blanket of snow is not permitted. All articles must be approved by judge. Schutzhund titles and IPO(1,2 and3) ( international working dog) titles, are virtually the same. 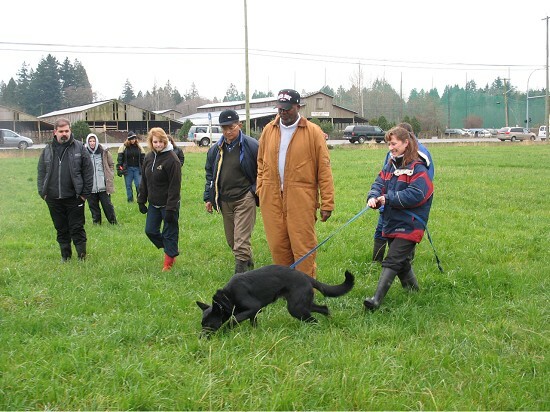 TR titles(tracking) – are awarded to dogs that are only being tested for tracking, not all 3 phases in one trial. SchH1 and TR1 tracks: laid by the handler with handlers own articles(2) that must be approved by judge. Track age is 20 minutes. Minimum 300 paces. 3 legs and 2 corners. SchH2 and TR2 tracks: track is laid by a tracklayer, using natural strides. 2 articles on track. Track is aged 30 minutes. Minimum 400 paces. 3 legs and 2 corners.